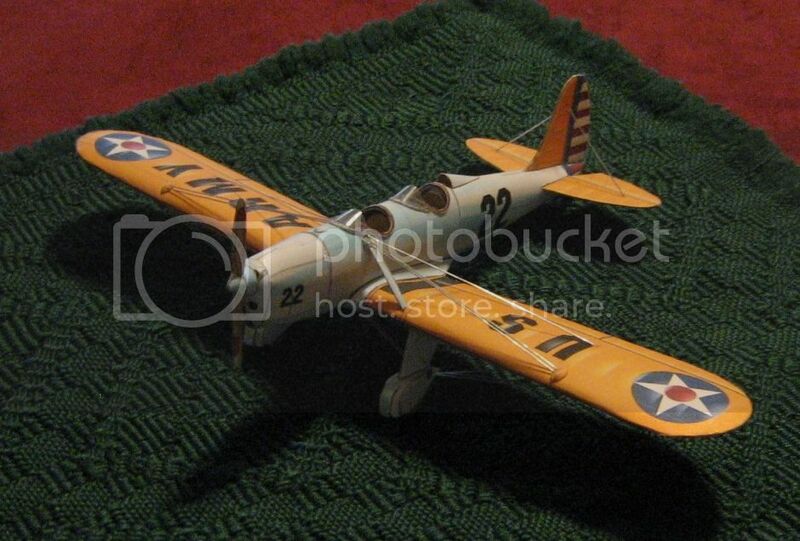 Here is a fun little plane to go with the Mystery Ship, the Wedell Williams, this is also in 1/48. 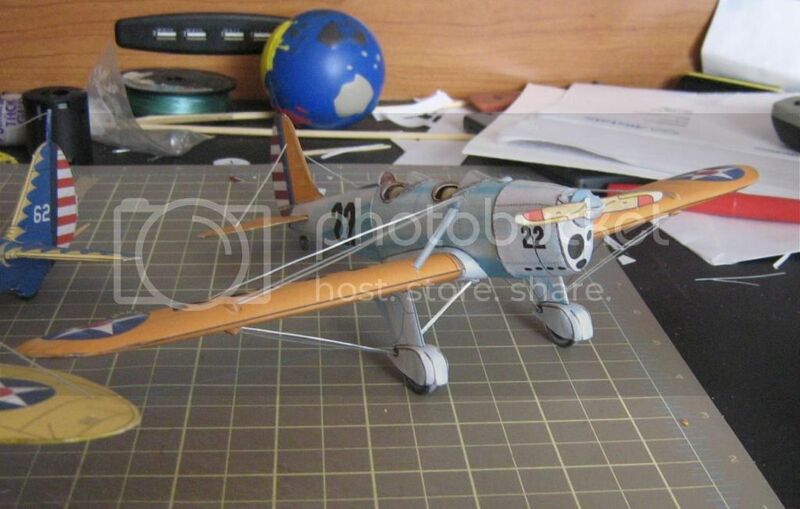 I put in the the 9 cylinder Sirus engine and used transparency film backed with bond paper for the canopy. Last edited by Burning Beard on Sat Nov 02, 2013 4:39 pm, edited 3 times in total. Last edited by Wad_Cutter on Sat Nov 02, 2013 6:51 pm, edited 1 time in total. The Wedell Williams didn't go together as smoothly as the Mystery Ship, I assume that is my fault, but then again what the heck. Anyhoo, I edited the post to show a close up of the front of the plane. Impressive, those 3D engines are a nice touch. Looks good for a tricky little model. 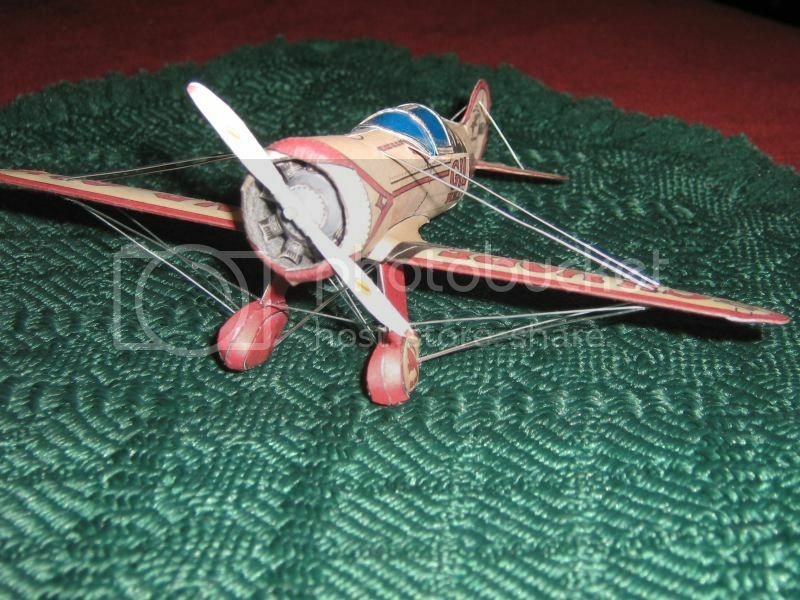 Once again, you've done a great job adding the little details with the wires and engine cylinders. 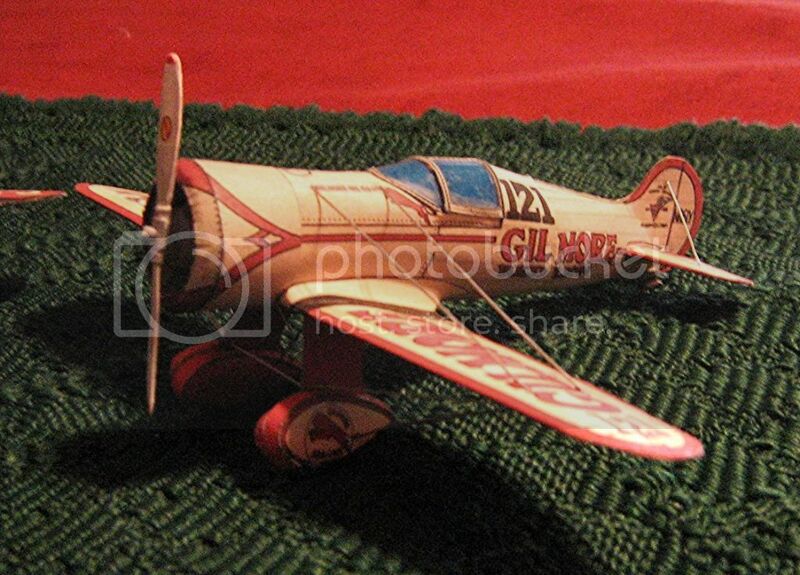 Thanks guys, I really like those early planes, especially the between the wars models. And, as I have said before the FG models are a perfect platform to build, be it either straight as received or with simple modifications to dress them up. Very nice racers Burning. I like a lot. Here is one that I'm pretty pleased with, the PT16. These have been a favorite of mine for years and even saw a whole bunch of them flying together over Moro Bay one evening when I was on vacation years ago. I occasionally see one flying overhead when there is an Air Show in Redding. 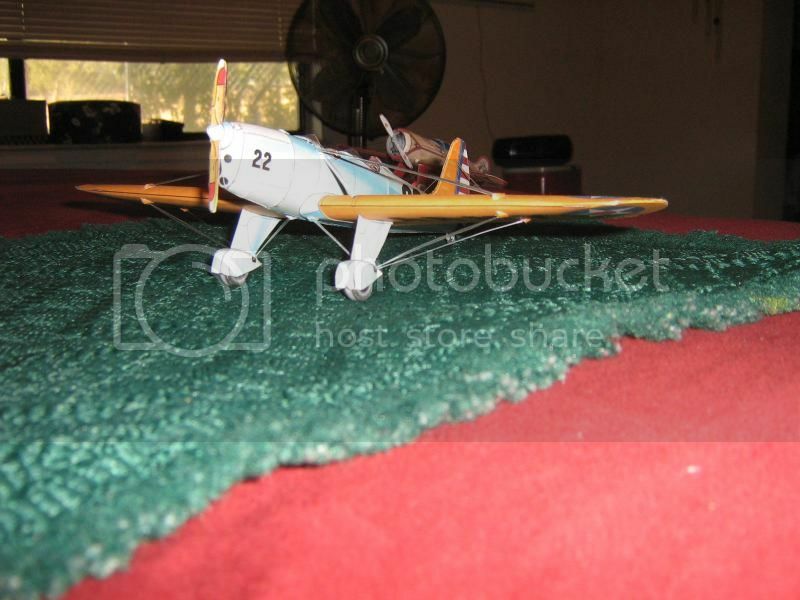 Anyhoo, this is pretty much a straight build, can't remember is I resized it but it was made 1/33, I even used the stock propeller. I did reinforce the wings and put in a spar for stability. I also added a couple of bulkheads the strengthen the fuselage. I added some blisters (which are visible on the original wing, and made the windshields out of transparency film. 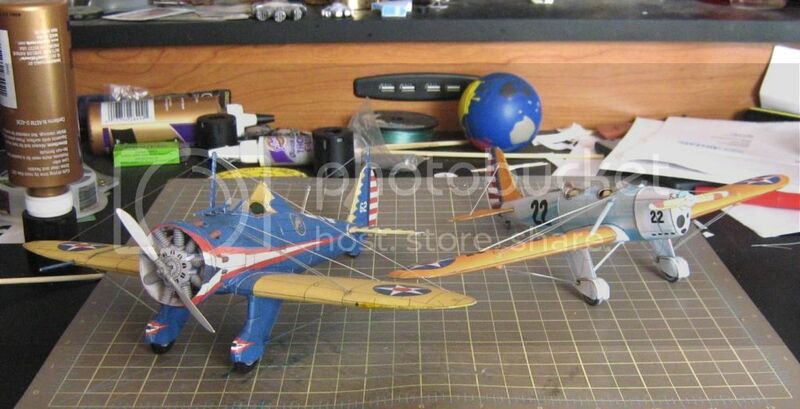 Here it is with a 1/33 Marek P26 to show a size comparison. Here are the underwing wires. Last edited by Burning Beard on Fri Nov 08, 2013 7:25 am, edited 1 time in total. Looks great! what'd you use for the rigging? It is thin floral wire. It comes in a roll and is very hard to straighten. Someday I'll figure out how to do that, but it works semi OK for short wires. table, just let it hang for awhile. The wire should straighten itself out. Great looking models......i really need to get one done...its been way too long!!!!!!! Thanks for the tip Texman, I'm hanging some wire now so it will be ready for my next project, whatever that will be. Those are the stock colors, I printed it straight out of the pdf.